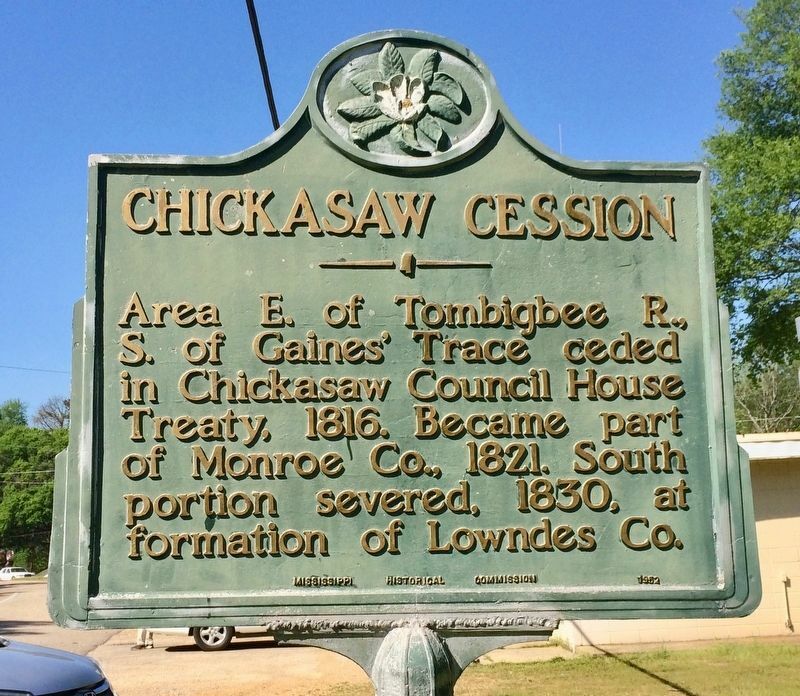 Area E. of Tombigbee R., S. of Gaines' Trace ceded in Chickasaw Council House Treaty, 1816. Became part of Monroe Co., 1821. South portion severed, 1830, at formation of Lowndes Co.
Erected 1952 by the Mississippi Historical Commission. Location. 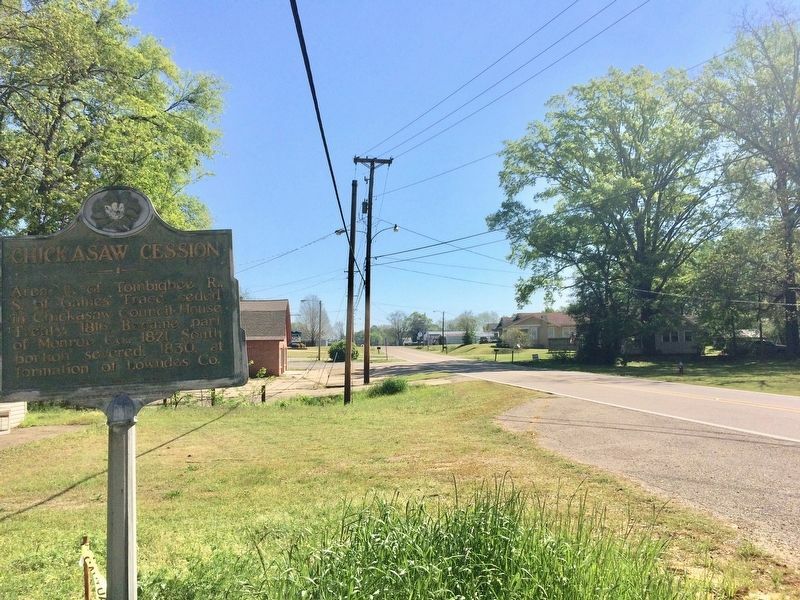 34° 0.009′ N, 88° 29.355′ W. Marker is in Amory, Mississippi, in Monroe County. Marker is at the intersection of Highland Drive (Mississippi Route 25) and Meadowbrook Circle, on the right when traveling south on Highland Drive. Touch for map. Marker is at or near this postal address: 1303 Highland Drive, Amory MS 38821, United States of America. Touch for directions. Other nearby markers. At least 8 other markers are within 12 miles of this marker, measured as the crow flies. Amory's Tribute to the Heroes of 1861—1865 (approx. one mile away); Gilmore Sanitarium (approx. 1.6 miles away); Becker Post Office (approx. 1.6 miles away); Mound Cemetery (approx. 2.3 miles away); Cotton Gin Port (approx. 2.7 miles away); Bienville's Fort (approx. 3.8 miles away); Camargo 1847 (approx. 8.9 miles away); Wise's Gap 1816 (approx. 11.4 miles away). Touch for a list and map of all markers in Amory. 2. 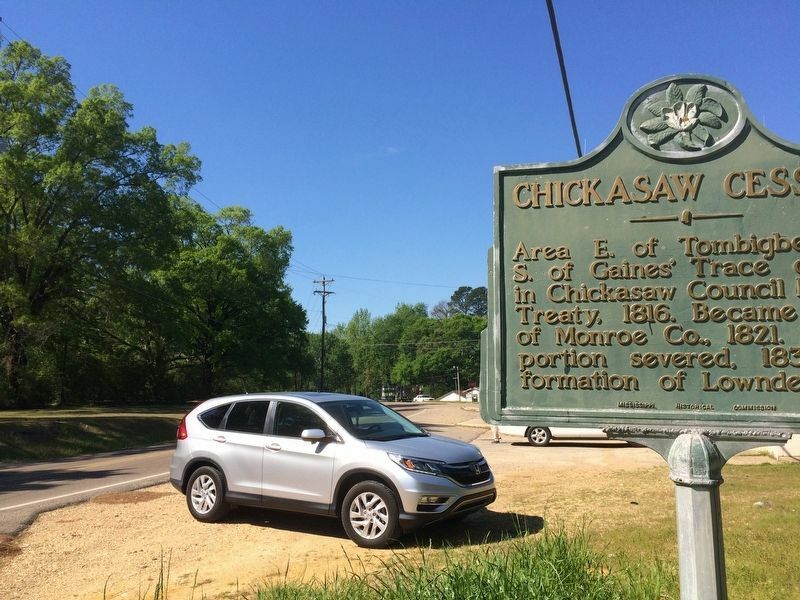 View from Chickasaw Cession marker north on Highland Drive. 3. Looking south from marker on Highland Drive. More. Search the internet for Chickasaw Cession. Credits. This page was last revised on April 10, 2017. This page originally submitted on April 10, 2017, by Mark Hilton of Montgomery, Alabama. This page has been viewed 187 times since then and 7 times this year. Photos: 1, 2, 3. submitted on April 10, 2017, by Mark Hilton of Montgomery, Alabama.